Such a lovely, gentle book. At first, I took issue with it that almost half of September had passed before I turned the last leaf. But then I was reminded, by wise readers with whom I blog, that good books take the time required. It is bad books that ought to be rushed through. Trollope writes with the wisdom of an omniscient narrator, able to disclose the weakness of his characters with a discerning and gentle eye. He uses a term – hobbledehoyhood – to describe the stage of a boy growing up, and while this book may have been written in 1864, I can clearly see my own beloved son just now leaving this stage at 24 years of age. Ah, but Johnny Eames is my favorite character in all the book. He thoroughly thrashes Adolphus Crosbie at the Paddington Railway Station, and well he should for all the wrong Crosbie has done to the lovely Lily Dale. Yet he saves Earl De Guest from the attack of a bull in his very own pasture, thereby earning himself an abiding affection from the earl. It takes a lot of work to grow up, apparently, to become a man, and John is not to be rewarded with Lily’s hand in this particular book. It’s enough to make me buy the final book in the series, The Last Chronicle of Barset, to see if they do in fact get together. I leave this novel, and my post, with favorite passages I highlighted on the way. Perhaps they will give you an idea of the charm within its pages. And here, I give a heartfelt thanks to Audrey, JoAnn and Lisa who kindly invited me to join their read-along. It was enriched on Twitter with so many comments and exclamations of surprise, as well as tender remembrances of fond characters met in the earlier novels. I came to the party late, but it was good to be included in the festivity, and to have my first taste of Trollope. What a sweet soul he is. As are you, and it was so nice to have you with us! (I first read this book when I was 40 coincidentally, and it’s mortifying to realize that that first quote is about the only thing I remember about it – so it’s all fresh. I bought the house we now live in at forty, and can hardly believe that it’s now fifteen years later. Another fifteen years and I’ll be…never mind. Still, isn’t it lovely to revisit a favorite book? I’m seriously tempted to carry on with you all into book six. Oh, I so hope you will koi us! I’m closing in on the 70% mark of Small House now and am loving every moment. What a lovely time we’ve had on twitter this month! the quotes are so intriguing. am I to understand there are prequels and sequels? This book sounds truly wonderful, Bellezza. I’ve wanted to read something by AnthonyTrollope for some time now. I will keep an eye out for this one. Thank you for a superb review. I had wanted to read Trollope for awhile as well, and this was the perfect opportunity. Now I’m “afraid” I’ll have to go on and read the last book of the series because I want to know what happens to everyone! By page 780+ the characters become friends. I hope you have the chance to read him soon. Thank you, Bellezza. By the way, I like your new blog design. It is refined and elegant. Sounds like you’ve been pleasantly surprised… I’ve been meaning to go back to Trollope at some point. I’ve only read one or two of his books and that was a long time ago, when I was nostalgic for England but before I was mature enough to really appreciate him. What? You mean you don’t ‘do’ proper grammar in your part of the world? Ah, yes, crumpets for tea and the gorse-bush on either side of the twisty country lane… there are still some small parts of England like that. I am not so sure about the condition of Trollope’s soul. He has an acid side, too, like his mentor Thackeray. You got a taster of that with Crosbie’s marriage. 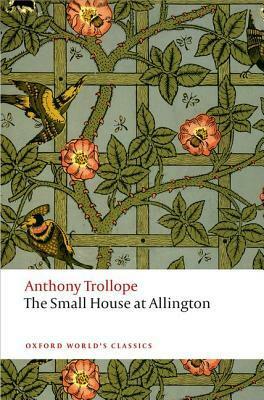 Small House is likely the sweetest of the Trollope novels I have read. His acid side is so clearly represented in Crosbie, but it isn’t unwarranted. And I was touched by his gentle side in creating brave and true Lily, as well as Mr. Dale who can’t really say to his sister-in-law that he wants her to stay in the Small House in gentle terms. He must convey his want/need gruffly, but she is astute enough to see his heart. I think that for me, overall, Trollope must own a sweet soul as well. Now I’m anxious to get to the last book and see how it all concludes. Thank you, too, Tom, for reminding me to take it slowly. Sometimes, I am like one of my third graders. I am glad that you liked this so much. I loved this book too. Johnny Eames may be my second favorite character in the The Chronicles of Barset after Mr. Crawley. I have an entire post dedicated to him and Lily. However, as he returns in the next book, it contains major spoilers. I think I must go on in the Chronicles of Barset, now. It’s been fun to have your exchange of tweets with the others as we read, and thank you for commenting here. How lovely to get to know an author all of you are already well aware of. I’m just starting with The Warden now. It is my choice for bookclub this month. I’m hoping to read some of it for the readathon tomorrow. Oh, the read-a-thon! And somehow I’ve completely forgotten about it this year. Well, perhaps I can squeeze some time in tomorrow. At any rate, I hope you enjoy your Trollope choice. It will certainly take most of the read-a-thon hours, but is well worth the time spent.